I conclude my two part interview with biographer to the stars David Kaufman. 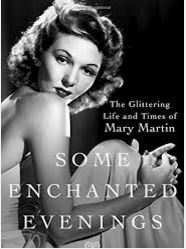 We discuss his new book “Some Enchanted Evenings” about the late Broadway star Mary Martin who was, according to Kaufman, a very likely, but closeted lesbian. She had extended long time relationships with film stars Janet Gaynor and Jean Arthur. Filmed at the still yet-to-open, Hell’s Kitchen eaterie Diane Elizabeth. (New York, NY) Producers of FIDDLER ON THE ROOF have cancelled the Tuesday performance on October 11th, which falls out on the evening of Yom Kippur, to give company members who observe the holiday the ability to do so. FIDDLER ON THE ROOF will instead play a special Columbus Day performance on Monday, October 10th at 8:00 PM, as well as a 7:30 PM evening show on bothSunday, October 9th and 16th. Fiddler on the Roof began previews at The Broadway Theatre (1681 Broadway, at 53rd Street) on November 20, 2015 and officially opened on Sunday, December 20, 2015. Fiddler on the Roof, whichThe New York Times declared a “superb new production”, will play its final performance on Saturday, December 31, 2016 at 2:00 p.m. Fiddler on the Roof’s December holiday schedule is as follows: Saturday 12/24 at 3PM, Sunday 12/25 – Dark, Monday 12/26 at 3PM, Tuesday 12/27 at 2PM and 8PM, Wednesday 12/28 at 2PM and 8PM, Thursday 12/29 at 7PM, Friday 12/30 at 2PM and 8PM, and Saturday 12/31 at 2PM. The regular performance schedule is: Tuesdays at 7 PM, Wednesdays at 2 PM and 8 PM, Thursdays at 7 PM. Fridays at 8 PM, Saturdays at 2 PM and 8 PM, and Sundays at 3 PM. Tickets are on sale online via Telecharge.com, by phone at (212) 239-6200, and in-person at The Broadway Theatre Box Office (1681 Broadway, at 53rd Street). Fiddler on the Roof, which boast a cast of 40 actors and an orchestra of 23 musicians, was nominated for three 2016 Tony Awards, including Best Musical Revival, Best Choreography (Hofesh Shechter) and Best Actor in a Musical (Danny Burstein). Additionally, Fiddler on the Roof took home two Drama Desk Awards for Outstanding Director of a Musical (Bart Sher) and Outstanding Actor in a Musical (Danny Burstein). Burstein was also awarded the Outer Critics Circle Award for the Outstanding Actor in a Musical. The cast of Fiddler on the Roof features six-time Tony Award-nominee and Drama Desk and Outer Critics Circle Award-winner Danny Burstein as Tevye, Tony-nominee Jessica Hecht as Golde, Jenny Rose Baker, Michael C. Bernardi, Adam Dannheisser, Hayley Feinstein, Mitch Greenberg, Adam Grupper, Adam Kantor, Karl Kenzler, Alix Korey, Samantha Massell, Melanie Moore, George Psomas, Ben Rappaport, Nick Rehberger, Jeffrey Schecter and Alexandra Silber. The ensemble features Jill Abramotiz, Julie Benko, Stephen Carrasco, Eric Chambliss, Ben Cherry, Austin Goodwin, Jacob Guzman, Jesse Kovarsky, Reed Luplau, Brandt Martinez, Zach McNally, Matt Moisey, Sarah Parker, Marla Phelan, Tess Primack, Jessica Vosk, Silvia Vrskova, Jonathan Royse Windham, Andrew Wojtal, Aaron Young and Jennifer Zetlan. Fiddler on the Roof is presented on Broadway by Jeffrey Richards, Jam Theatricals, Louise Gundand Jerry Frankel. This is part one of a two part interview, soon to air on Friday, Sept. 9 at midnight on Ch.56 and Ch.1996 on Time Warner Cable in Manhattan and Ch.83 on RCN Cable and Ch.34 on Fios, also on Friday at midnight. In Manhattan Only, although it can be seen online at that time on http://www.mnn.org, click on Ch. 2, the Lifestyle channel. Filmed in the yet-to-open new Theater District restaurant Diane Elizabeth.